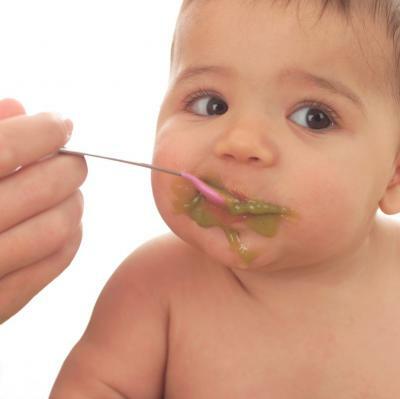 Some commercial baby food has added sugars, salt and starch. Babies and toddlers are at an age where they are developing tastes for different foods, but all of these additives could work against those developing tastes. When making food at home, the use of salt and sugar should be avoided as much as possible. Fresh ripe produce is naturally low in sodium and is generally the best choice. Plain frozen vegetables or unsweetened frozen fruit are a good second option, while canned food should be the last choice. However, if using canned vegetables, buy the no-added-salt variety, and if purchasing canned fruits, buy fruits that are packed in their own juices. Before making homemade baby food, wash your hands and any equipment used. Infants are at a higher risk for foodborne illness so it's imperative that you practice safe food handling. Wash produce under clean, running water even if you plan on cutting it to avoid cross contamination. Most vegetables, such as peas and sweet potatoes require cooking by way of baking, boiling or steaming. Use as little liquid as possible and if necessary, try adding some of it back in when pureeing or mashing so that few nutrients are lost. The pureed food may be stored in the refrigerator; fruits and vegetables can be stored for 2 days, but meats should be used within 1 day. Baby food may also be frozen for up to 1 month. Freezing in ice cube trays work well. Each cube is approximately 1 ounce, which can minimize waste by defrosting only what's needed. Remember to defrost foods in the refrigerator, never on the counter, and throw away any uneaten leftover food in the baby's bowl. When considering whether or not to make your own baby food you need to consider cost and convenience. Homemade baby food is generally economical, but it's not always the case. If buying more expensive organic foods or out of season fruits and vegetables you may be spending more than commercially prepared. Also, you need to ask yourself if you have the time. Don't feel bad if you decide to just buy your baby's food. As long as you read the ingredients and avoid too many additives, you are still providing your baby with excellent nourishment. Since I already prepare fresh fruits and vegetables for my family, I think I'll plan on making a little extra to put away for my growing baby. But I'll still have a few jars of commercial baby food tucked away in the cabinet for those times where convenience trumps all! Place green beans in a vegetable steamer. Steam, covered, for 15 minutes or until very tender. Remove beans from steamer and place in a food processor, reserving cooking liquid. Start with adding 1 Tablespoon of reserved cooking liquid to beans and process. Continue adding reserved cooking liquid, 1 Tablespoon at a time, until desired consistency is reached. If needed, strain using a sieve or food mill and discard solids. Spread green bean puree into clean ice cube trays and freeze.